South Korea has targeted the robotics industry, specifically intelligent service robots, as a growth industry for the future. An interesting recent development in this field is the introduction of Engkey, and English-teaching robot, into elementary school classrooms in Seoul. 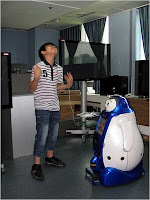 Engkey is a penguin-shaped robot developed by a team at the Korea Institute of Science and Technology's (KIST) Center for Intelligent Robotics that recognizes the human voice. Read the New York Times account for an interesting description of how Engkey interacts with school children. The introduction of Engkey (click on graphic at left to see a full-size version) was part of the Ministry of Education, Science and Technology's plans to use robots as teaching aids. In February, the Ministry began deploying hundreds of them as part of a plan to equip all 8,400 of the nation's kindergartens with robots by 2013. Work at the Center for Intelligent Robotics illustrates Korea's ambitious plans for the robotics industry. Last month, it announced a trial service for 11 types of intelligent robots this year. They include “kiosk robots” to roam amusement parks selling tickets, and “robo soldiers” that will man part of the 155-mile border with North Korea with a never-sleeping camera eye, night vision and lethal fire power.